A new magazine launches today to commemorate Ireland's military past. 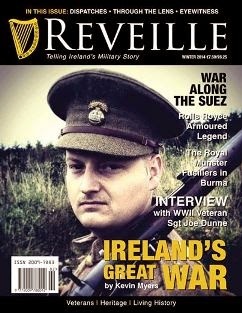 Reveille magazine is a 64-page quarterly publication that intends to tell the story through the eyes of Ireland’s military veterans, Ireland’s military heritage, and living historians dedicated to preserving Ireland’s military past. Each issue will showcase Ireland’s military heritage sites such as battlefields where Ireland’s men and women fought and died and museums where Ireland’s military story is preserved as far back as the Iron Age. Bringing alive Ireland’s military heritage are the various branches of the serving military and preservation groups who together magnificently restore and bring back to life the aircraft, weapons and vehicles that Ireland’s soldiers used or came up against over the centuries. In the run up to today's launch, Reveille's team has been publishing samples of the first issue's articles. These can be found on the magazine's facebook page. Take a look. With a neat presentation, they seem to convey a lot of useful information that will help family historians to understand more of their ancestors' lives in the armed forces. The official launch will be announced today at the National Museum of Ireland, Collins Barracks, Dublin, at Noon, by Brigadier General Paul Pakenham (Retd) of the Military Heritage Ireland Trust Ltd. Initially the magazine will be available only by subscription (to subscribe, click image) but it may become available via newsagents and booksellers in the future.